Early puberty means early breast development, which puts girls at a higher risk for breast and uterine cancer. In 2010, Pediatrics published a study that found one in 10 girls have already begun developing breasts—the first sign of puberty—by the age of eight. This is not an innocuous finding. Early puberty means early breast development, which puts girls at a higher risk for breast and uterine cancer—as well as eating disorders, depression and early sexual activity, among other challenges. Experts aren’t sure what’s behind this trend, but endocrine disruptors keep popping up as a probable cause. Endocrine disruptors include BPA, found in hard plastics, food-can linings and cash register receipts, and a class of chemicals used to soften plastics and stabilize synthetic perfumes, called phthalates. Both substances have been linked to early puberty in animals. Don’t microwave meals in plastic containers or wraps; store food in glass or dishware, especially if it’s warm. And on a monthly basis, practice patience. Thank you for calling attention to this dangerous, yet hidden, issue! I also want to point out that endocrine disruptors are prevalent, not just in plastics, but in many personal care and cleaning products! Some products contain multiple endocrine disruptors too – sunscreens are especially notorious for this. It’s all about the ingredients, and consumers really do need to read the labels! Yes, absolutely. Take a look at my health & beauty red flags article for more http://www.mommygreenest.com/health-beauty-red-flags/ and there’s also this one on sunscreen http://www.mommygreenest.com/3-step-to-stop-getting-burned-by-bad-sunscreen/. 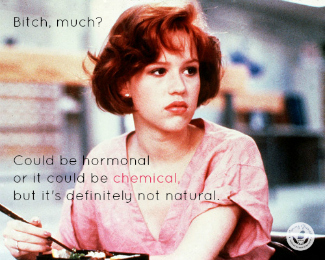 With phthalates in beauty products, a great thing to remember is to avoid synthetic fragrance. Thank you for writing Jody! My daughter is 9, and last year we had to have her hand x-rayed to check for an abnormal growth rate. The reason was because she was starting to grow breast buds at 8 years old!!! The results came back “normal”, but I knew something needed to change in our home. I have heard of all sorts of problems it could be ( milk and meats with hormones for example). Plastic was never something I came across as a possible reason, or that even crossed my mind! But it makes sense! Thank you for this post!!! Ive been eliminating plastics in our kitchen slowly but surly, and THIS gives me yet another great reason to just get it all out right now.